City leaders, railroad executives and history buffs turned out en masse Sept. 5, 1926, when the Los Angeles Chamber of Commerce celebrated the 50th anniversary of the driving of the golden spike that united northern and Southern California by rail at Lang Station in today's Canyon Country, just east of the modern Shadow Pines exit off of State Route 14. A modern Southern Pacific engine was outfitted with a smokestack and renumbered No. 38 for the occasion, the same number borne by the 10-wheel engine that lumbered south from Tehachapi 50 years earlier to meet the eight-wheel engine No. 25 that was coming north from Los Angeles. The chamber of commerce turned the so-called "Wedding of the Rails" into a Hollywood spectacle; on instruction, participants donned Hollywood-style cowboy and Californio garb and Plains Indian regalia for memorilization on film. The choice of attire eludes us, except that this was the era of "blood and thunder" movies that portrayed the West as it never was. Absent from the 1926 ceremony were representatives of the Chinese immigrant workers who physically built the railroad. The omission was rectified at the 100th anniversary reenactment in 1976 and the 125th anniversary reenactment in 2001. The Santa Clarita Valley Historical Society and Chinese-American organizations participated in both, and both ceremonies were officiated by March Fong Eu, California's secretary of state from 1974 to 2006. At least the SPRR Lang depot was still standing for the 1926 reenactment. Reenactors in 1976 and 2001 had to use their imagination. Rail Romance to Be Re-lived. Oxnard Press-Courier | September 3, 1926. T.E. Walker, superintendent of the Municipal Water Department, who was present at the celebration of "The Wedding of the Rails" 50 years ago, has been invited with other old timers to be a guest of the Los Angeles chamber of commerce at the celebration Sunday. He has received his transportation order for the event and will ride on the same old train that was used 50 years ago. The Los Angeles Chamber of Commerce asks those who attend to dress in costume if possible as a moving picture will be made of the celebration and only those in costume will be in the picture. Pioneer residents of California, including many early day railroad men, are to join with business men on Sunday, September 5, in celebrating the golden anniversary of the "Wedding of the Rails" ceremony which on the same September day 50 years ago marked the completion of the first railroad into Southern California from the north. The celebration will be held at Lang, 12 miles north of Saugus and about 57 miles from Oxnard, which was the scene of the closing of the gap in the rails that gave the southern part of the state its initial rail contact with the outside world. As was the case half a century ago, a train of the vintage of 1876 will leave Los Angeles at 9 a.m. Sunday morning carrying the official delegation from Los Angeles. It will meet at Lang a modern train from San Francisco and the driving of a golden spike will be re-enacted. Other ceremonies will include an exchange of greeting between the mayors of San Francisco and Los Angeles, an old-time dancing contest among pioneers, a scene to represent the last stage coach run between Mojave and San Fernando and similar colorful events. The gold spike is to be driven by William H. Crocker, San Francisco banker, whose father, the late Col. Charles S. Crocker, then president of the Southern Pacific, drove the original spike at Lang on September 7 [sic], 1876. 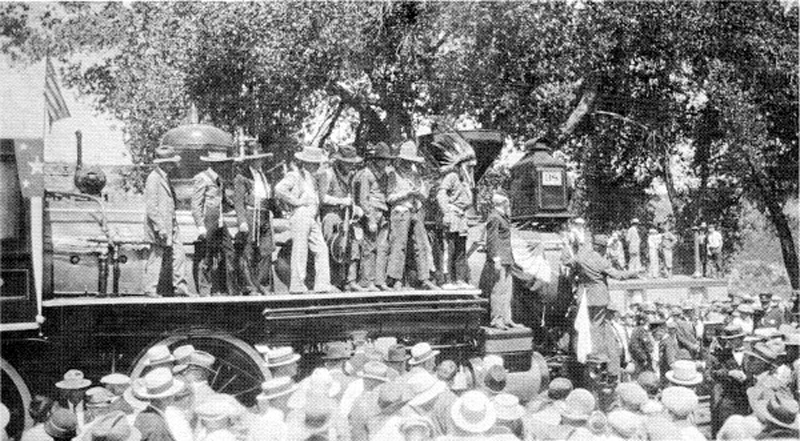 Following the ceremonies, the old and the new trains are to leave Lang at about 3 p.m. for a "parade of the rails" to Los Angeles, where on the following day the little old locomotives and coaches, as well as the most modern railroad equipment including a monster "Southern Pacific" type three-cylinder locomotive, will be placed on exhibition in Exposition park in order that it may be viewed by school children and their elders. The celebration is arousing much interest, especially among pioneer residents, and will aid in calling attention to the great progress and development of California during the last 50 years. 'Wedding of the Rails' Fete is in Celebration of Half Century of Service. Associated Press | As published in the San Bernardino County Sun | September 6, 1926. 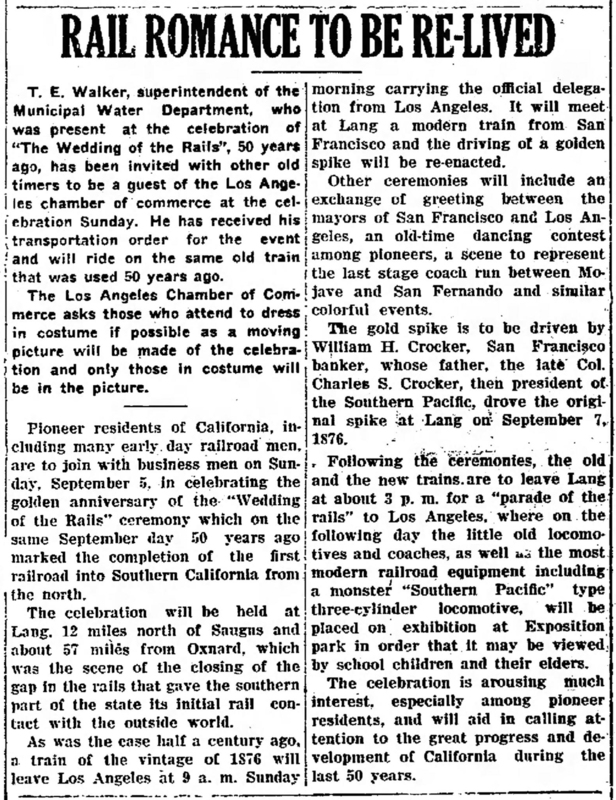 Lang, Cal., Sept. 5 — The "wedding of the rails" was reenacted here today in celebration of fifty years of railroad communication between Los Angeles and San Francisco. The ceremony was climaxed by the driving of a golden spike alongside of a similar one embedded a half century ago to mark the union of the rails. Among today's spectators were many who had witnessed the historical event and they were attired in the mode of 50 years ago. Prim, white haired women appeared in dresses trimmed with lace and bright colored ostrich plumes set off their quaint bonnets. The men stood by in frock coats and old cutaways. The scene was made more vivid when a train composed of an archaic engine, a little wooden box car and three small wooden coaches pulled up to the spot. It was a replica of the first trains which the Southern Pacific ran between the two cities. The "Pioneer's Special" had made the run from Los Angeles with the help of a modern "Iron horse." The picturesque train with its coaches loaded with old timers in holiday attire was met head-on by a special train from the north. As the two engines pulled up to within a few feet of each other, Mayor James Rolph Jr., of San Francisco, stretched out his arm and grasped the hand of Mayor George Cryer of Los Angeles. 2. Hardly. Men might have worn similar clothing somewhere, sometime, but not around here at that time. Female participants were more properly attired. HS2601: 2400 dpi jpeg from printed copy.